Coveting 100% customer satisfaction, we, as a prominent figure, put a great effort in delivering excellence. 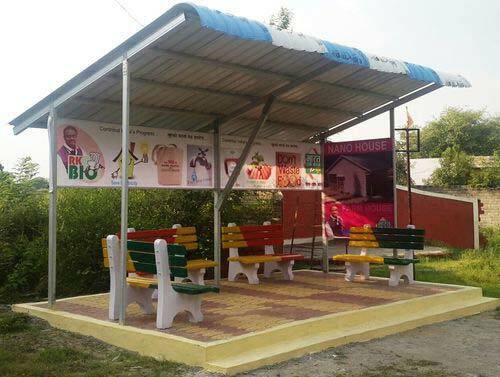 Bus Stop Shelter is available in a variety of designs and sizes. It is manufactured by trained engineers to make sure there is no compromise with the quality. The world class raw material used in its manufacturing is procured only from certified vendors. A variety of custom designs are available for our customers to choose from. 20ft (L) X 13ft (W) x10ft (H) With 4 cement Benches/floor etc. 10ft (L) X 10ft (W) x9ft (H) With benches, floor and ad board. Benefits & Feature : Most Economical and fast installation Light structure, Easily re locatable No welding at site is required These sheds can be resold Aesthetically superior and most economical Time saving in completion of project Most hygiene.